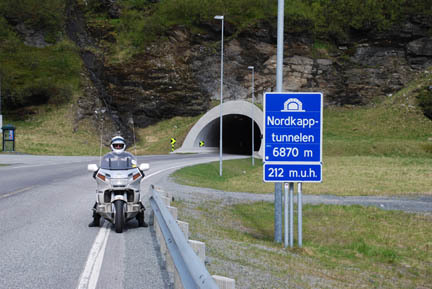 Heading south we traversed the tunnel off Nordkapp island and drove along the fjord. The "6870 m" means 6,870 meters long (over 4 miles) and the "212 m.u.h." means 212 meters under sea level (or about 700 feet). The next 150 km. is a landscape of tundra and rock. Nothing growing is above knee high. After that we left the fjord and drove into hilly country with scrubby brushy Birch, then the Birch became trees and then we added a type of pine that looks very similar to Lodgepole Pine. The ground has changed from rock with a thin layer of soil into dirt with mixed rock, the remains of the retreating glacier's moraine. From the higher spots one can see a rolling landscape stretching for many kilometers with elevations averaging about 250 m. (800 ft.). It is pretty country. Go to the Road South for more.